Let’s Explore: Zoo introduces budding animal enthusiasts to all the animals at the zoo. With this fun interactive kid, children learn about primates, birds, big cats, and sea creatures, as well as the work that goes on behind the scenes to keep the animals healthy. 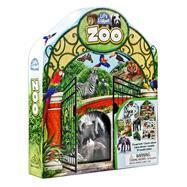 A 32-page book full of facts about life at the zoo is accompanied by three plastic animal toys, a two-piece diorama, four models, and 25 reusable stickers. A children’s book editor, Lori C. Froeb has also had the opportunity to write many books for kids. Nonfiction projects are her favorite, particularly when the focus is the animal kingdom or the human body. She lives in Westchester County, NY.